from grade schools and vocational training all the way up to world-renowned universities. 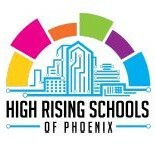 The “High Rising Schools of Phoenix” is a PR campaign, led by the Committee’s efforts, promoting the quality of a downtown Phoenix education. Downtown is filled with amazing educational institutions, from grade schools and vocational training all the way up to world-renowned universities. In order to attract a broad range of residents and employees, it is essential to increase public awareness of the quality education choices in Downtown Phoenix. The Education Committee connects with and promotes Downtown’s public and private universities, colleges, K-12 schools, in addition to the vast network of workforce development and training institutions.